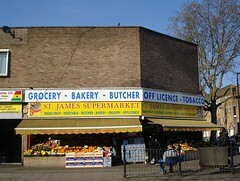 24-hour supermarket, deli, butcher, baker, and off licence on Southwark Park Road in Bermondsey. The frontage advertises English, Turkish, Cyprus, Greek, Polish, Chinese, and "all over the world" food, though the focus is really on the Turkish/Eastern European side. A wide selection of fresh fruit and vegetables is displayed at the front, including several kinds of chillies and fresh herbs such as coriander and dill. Inside are long aisles of pickled, canned, dried, smoked, and other preserved foodstuffs. A reasonable selection of interesting beers and ciders (including cherry cider) are to one side. There's a butcher's counter further back, which on occasion has exciting things like sheep's heads, chicken livers, and quails. Right at the back are shelves displaying various breads baked on the premises. Stuffed flatbreads (£1.20/piece as of March 2010) are often on offer beside the till, and well worth getting if they have any left — these may be stuffed with spinach and cheese (and sometimes chilli too), or perhaps chicken. Accessibility: No step to get in. The aisles aren't exactly wide, but aren't as narrow and crowded as they can often be in this kind of shop. Last visited by bob, March 2011. Last edited 2017-08-14 12:51:25 (version 4; diff). List all versions. Page last edited 2017-08-14 12:51:25 (version 4).